Rafael Ramirez, security council president and Venezuela's ambassador to the U.N., talks to the press as he arrives for UN Security Council consultations. A cousin of the former Venezuelan oil czar, Diego Salazar, was arrested in an investigation into a series of accounts in an Andorran bank suspected of being used to launder about $1.6 billion in corrupt funds, Venezuela's attorney general announced Dec. 1, 2017. 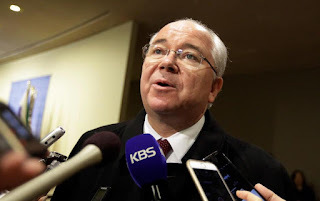 CARACAS, VENEZUELA (AP) — A cousin of former Venezuelan oil czar Rafael Ramirez was arrested in an investigation into a series of accounts in an Andorran bank suspected of being used to launder about $1.6 billion in corrupt funds, the chief prosecutor announced Friday. The arrest of Diego Salazar comes amid a widening corruption probe into Venezuela's state-run oil industry that some see as an attempt by President Nicolas Maduro to consolidate power within his socialist party ahead of next year's presidential elections. Many proteges of Ramirez have been detained, including former Oil Minister Eulogio del Pino and Nestor Martinez, ex-president of state oil company PDVSA. Ramirez himself has not been arrested though there are unconfirmed reports he has been dismissed from his current post as Venezuela's ambassador to the United Nations. Some observers see him as the ultimate target of the purge. In a telephone interview broadcast on state-run television, Attorney General Tarek William Saab said Salazar is accused of money laundering and association to commit a crime. Salazar and others would be linked to a corruption scheme in the bank in Andorra, a nation of 85,000 inhabitants between Spain and France, Saab said. In 2015, Andorra intervened in the Banca Privada d'Andorra, or BPA, after the U.S. Treasury Department accused it of laundering money from groups in China, Russia and Venezuela. Saab said that documentation obtained by Venezuela's Public Ministry includes contracts between the parties and bank transfers that suggest attempts to defraud state companies and agencies, and launder about $1.6 billion in funds. Local media are reporting that Salazar is being held at the headquarters of the Bolivarian National Intelligence Service. Salazar's arrest follows the detentions of Martinez and Del Pino on suspicion of embezzlement, criminal association and money laundering. Del Pino was replaced last week by National Guard Gen. Manuel Quevedo. Ramirez served as Venezuela's oil minister from 2002 to 2014, and lead PDVSA from 2004 to 2014. He was close to late President Hugo Chavez. He became Venezuela's U.N. ambassador in 2014. Previously, Saab has said the oil arrests fulfill a government pledge to assure Venezuela's vast oil wealth is spent on the poor and isn't pilfered by corrupt officials. While corruption in the country sitting atop the world's largest oil reserves has long been rampant, officials are rarely held accountable — a major irritant to Venezuelans now struggling to eat three meals a day amid widespread shortages and triple-digit inflation.